The results are just as astounding as the process. The proof is in the bottom line. With Mabus Agency’s creative engine behind it, Texana is skyrocketing toward its goal at twice the speed its leaders anticipated. Before partnering with Mabus Agency, Texana was a solid bank run by the same family since its founding over a century ago. 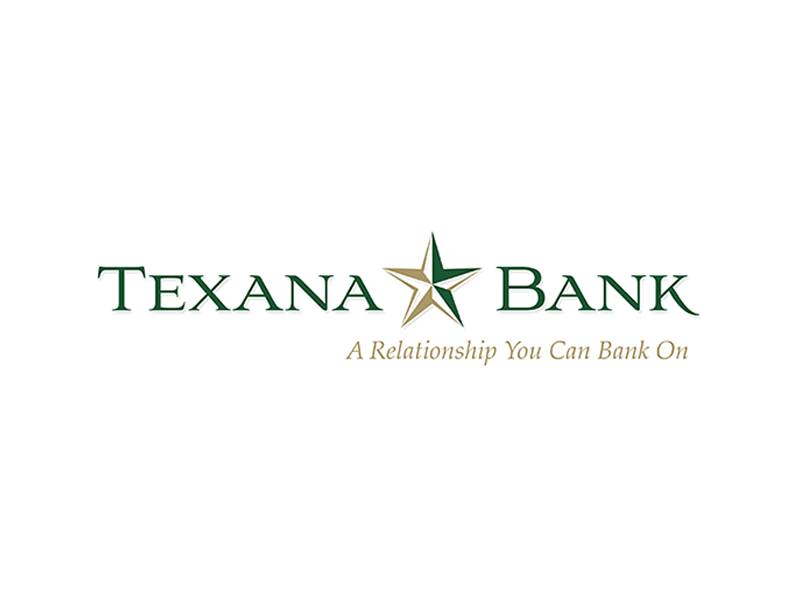 Possessing a big bank’s capability with a small bank’s personal touch, plus a heart for its customers and community, Texana should have been poised to succeed in the tumultuous banking climate of Northeast Texas. Mabus Agency’s challenge was to create a brand as good as Texana’s product. Mabus’s creative team worked diligently to bring Texana into the modern banking world without losing touch with the bank’s rich heritage. The result is a bank that’s up to date but not trendy, capable but not corporate. A bank that’s here today and will be here tomorrow. 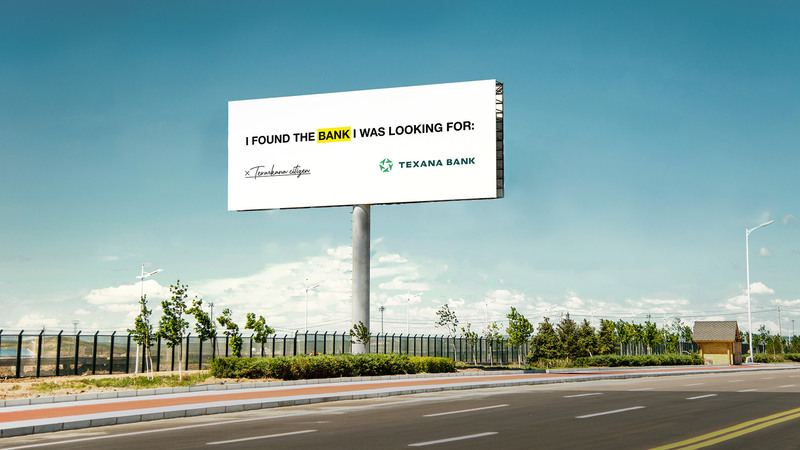 Texana Bank’s brand had to leave an imprint on the customer and impress a feeling of confidence—even after just one look. It was vital to convey the bank’s reliability and capability while also looking sharp and working hard. And, internally, the brand needed to be be something employees could rally behind. Texana’s brand had to leave an imprint on the customer and impress a feeling of confidence—even after just one look. Texana’s new logo serves as a centerpiece for the bank’s entire new brand. The graphic draws the eye to the star in its negative space, a tribute to the bank’s deep Texas roots. Simultaneously, the arrows forming the star communicate that Texana is constantly thinking about how to better serve the community. Texana’s color palette is simple, employing soothing shades of green and blue. It communicates a bank that empowers its customers to manage their finances without fear. 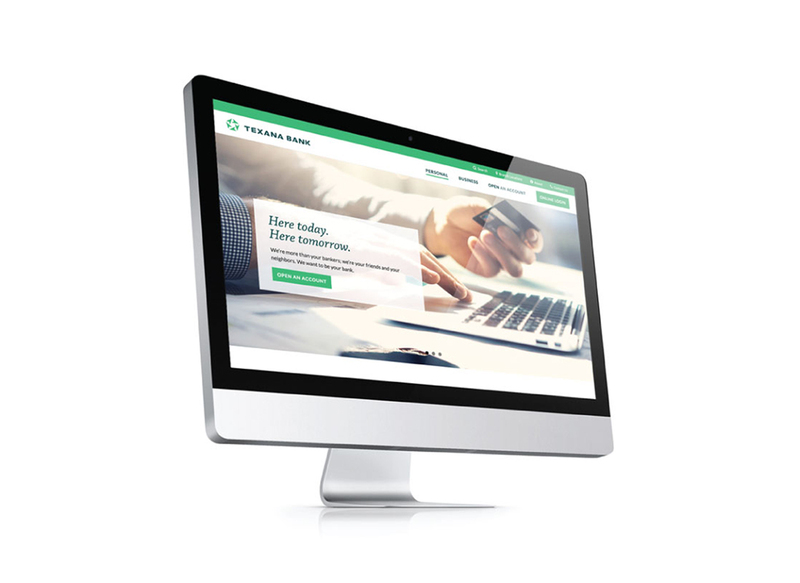 Texana isn’t just a resource, but a helpful hand navigating the complicated world of banking. The uncluttered brand fonts utilize typography that is simultaneously unique and classic. They subtly stand out and enable brand recognition without requiring the logo or wordmark. Furthermore, the typography reinforces Texana's promise of a simplified and straightforward way to bank. Texana’s low name recognition provided an opportunity to make a strong first impression and the freedom to positively shape customers’ perception of the bank. Customers within the footprint felt unheard and unappreciated by their banks. Texana urgently needed to show it recognized the middle-class, hard-working customers in need of simple, stress-free banking. Texana utilized direct mail and billboards to launch a bold campaign showing its willingness to meet customers where they are. Swipe left and right to reveal the billboard campaign. Faced with fulfilling immediate advertising needs, Mabus Agency contended with creating new—but unfinished—brand work or reinforcing Texana's old, existing brand. Instead of advertising the bank itself, Mabus Agency and Texana gave the customers a megaphone. They put real quotes from customer surveys on the billboards, neglecting to mention Texana at all—a gamble, but one Mabus Agency and Texana believed in. There it was in black and white for all Texarkana to see. The billboard wasn’t located near a Texana branch or any competing bank, so no one was sure whose billboard it was. It’s hard to gauge the effectiveness of a general awareness medium like a billboard, but it soon became clear how much attention the campaign was drawing. Customers came into Texana saying, “Can you believe someone said that?” and, even better, “They must not bank with y’all.” Meanwhile, other banks copied the idea and published billboards positioning themselves as honest banks. But Texarkana banking customers saw right through that. The new Texana had arrived. Mabus Agency’s web team totally revamped Texana’s website, making it one of the most useful and dynamic tools in Texana’s arsenal. Texana’s previous website consisted of more than 100 pages of banking information. Mabus Agency started by streamlining Texana’s site map, making products and relevant information more accessible. 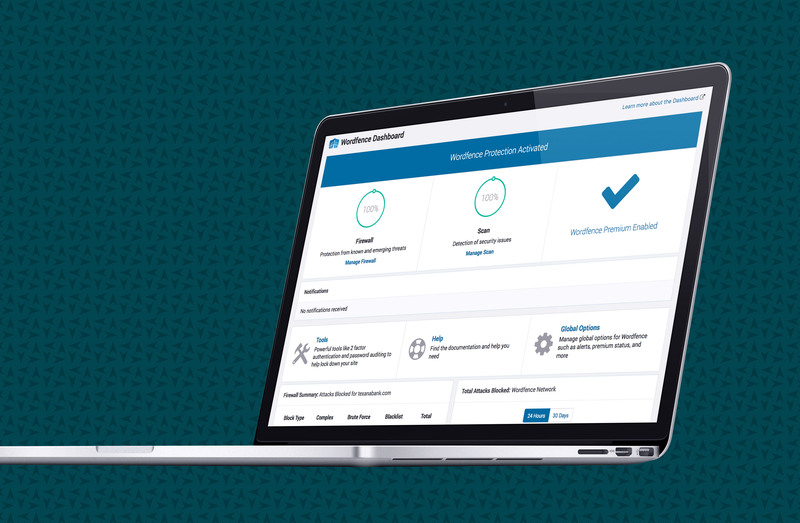 Now, customers can easily find their way to an online mortgage application and navigate the site’s branch locator. The site works in perfect tandem with Texana’s mobile banking app, which sports the same smooth efficiency. On the back end, Mabus Agency’s web team utilized third-party security software to create a digital Fort Knox to keep sensitive customer information safe and secure. Secure Sockets Layer technology and 256-bit encryption come standard with Mabus Agency’s server hosting service. Mabus Agency keeps these security protocols up to date even after the site goes live, providing peace of mind where it really counts. A bank’s app should be more than an afterthought. So, we thoughtfully applied Texana’s brand to its already incredible app. 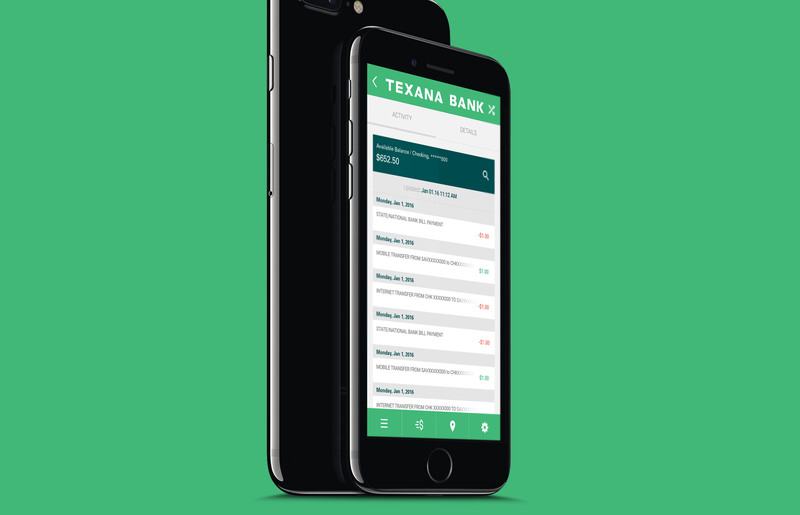 Now Texana’s app looks as good as it functions, and fits in as a vital tool ready to be used by anyone from the most traditional banking customer to the tech-savvy millennial. Texana came to us with a gutsy goal. Great work is done when you set great goals. Texana Bank came to us with an incredible goal: to double its asset size in two years. The bank knew the future of small banks, and the owners were dedicated to serving their communities for the long haul. There’s no playbook for growth like that. But between some great business decisions and its new brand firmly in place, Texana is well on its way. In fact, assets are growing at twice the rate Texana anticipated. Honesty. Not only is it the best policy, but it’s also key to attaining audacious goals. The bank’s leaders were honest about Texana’s strengths and shortcomings. As a small bank, it’s easy to either puff up or be defensive when compared to larger competitors. When you can truly see yourself as you are, though, magic begins to happen. Texana embraced its size as a starting point for growth and committed to retain their community bank service no matter how large they grew. Hard Work. Growth doesn’t happen without hard work. From the very beginning through the brand unveil, they worked alongside us to guide our work. Mabus Agency will always match the commitment of clients like that. We’ll do whatever needs to be done, even if it brings us out of our comfort zone. In bringing Texana’s new brand to life, Mabus Agency helped redesign the bank’s physical locations, and, at times, even negotiated with building contractors to ensure proper application of signage and other materials. We developed a new budget together—one that took into consideration a rebrand and a sustained marketing effort after the dust settled. Every rebrand has a life of its own. To be truly successful in an endeavor such as this, everyone must work hard in an open partnership that allows true magic to happen—for brand, messaging, and strategy to take on a life of their own and become something that’s impossible to engineer. It makes everyone better. Working with Texana made Mabus Agency better, it made Texana better, and it made the Texarkana community better. If we could help this bank outpace its goals, what would we do for you?